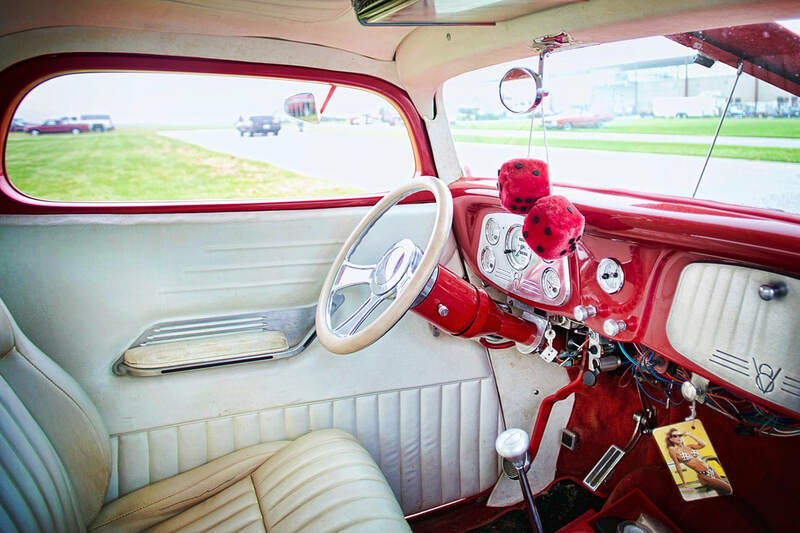 ​When it comes to your leather upholstery for your classic car, proper maintenance is the secret to keeping your upholstery looking good as new. Maintenance can be a hassle, if you aren’t prepared for the task. There are many techniques, and cleaning products, so take the time to research what is best for your specific leather upholstery. This will guarantee, that you won’t risk accidently damaging your upholstery. ​The reason why cleaning your interior is worth all the hassle, is because regular light cleaning will help maintain your seats and increase their lifespan. ​Here are a few tips, on how to keep your interior showroom ready. 1: What Type of Leather? You need to know if you have finished or unfinished leather. 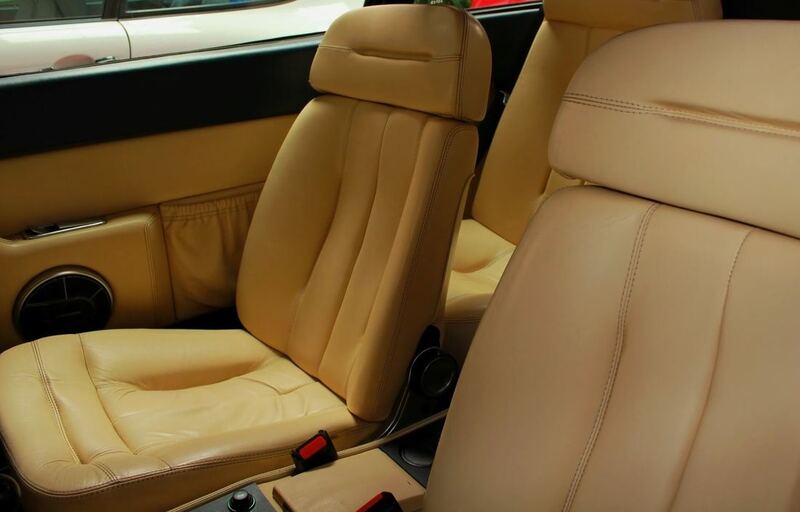 Most car manufactures disclose the type of leather used in car seats, but if you still aren’t sure, test a small dot on an inconspicuous area with water, if it leaves a mark, it is uncoated leather. Uncoated leather: While unfinished conditions nicely, it doesn’t repel liquids. For this reason, you need to use a quality conditioner in addition to a cleaners. Look for products that are PH-balanced, and safe for uncoated leather, to ensure you restore the leather’s natural beauty. Coated leather: There is no need to use a leather conditioner, because the conditioner won’t be able to be absorbed. So after you are finished cleaning the upholstery, use a high-quality protectant to prevent fading, cracking, or stains. Dry Brush: Whenever you have a chance, run a dry clean soft-bristle brush rub in circular motion over the leather features. This will help prevent debris from building up, and collecting on your seats which could cause potential damage. Vacuum: A couple times a month or as often as you deem relevant, use a vacuum to remove all debris fragments from your interior. Detailing:You can leave the cleaning to an auto detailing expert once a month. They will be able to properly car for your upholstery, and warn you of any potential issues, and can give you a reliable estimate to get the problem taken care of quickly. 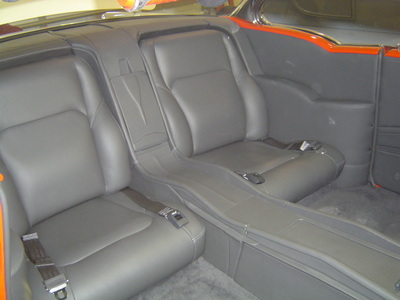 However, you can also clean your vehicles upholstery regularly yourself. Cleaning: Leather can be clean with a combination of warm water, and neutral soap, or invest in a cleaner specifically for your leather upholstery. Use a soft cloth to apply the clean solution, as soon as you have given the surface a good cleaning, remove the solution with a dry microfiber cloth. Don’t leave the solution on the leather, dry by itself. If you would like to do regular monthly cleaning, invest in a leather specific cleaning solution. Please beware, that too much water-based solutions will weaken the fabric and color with regular use. However, specifically designed leather cleaning solution, will not damage the fabric in anyway. ​Use the same method, but spray cleaning solution onto microfiber cloth, rather, than directly onto seat. Always clean a small section at a time. When selecting a product solution, always start first with the less aggressive to the most aggressive solution if needed. A steamer will work wonders to exfoliate your seat. Spray some solution of the area, put a microfiber towel over the steamer, applying moderate pressure, work over small areas at a time,and use another towel to frequently dry the finished seat. 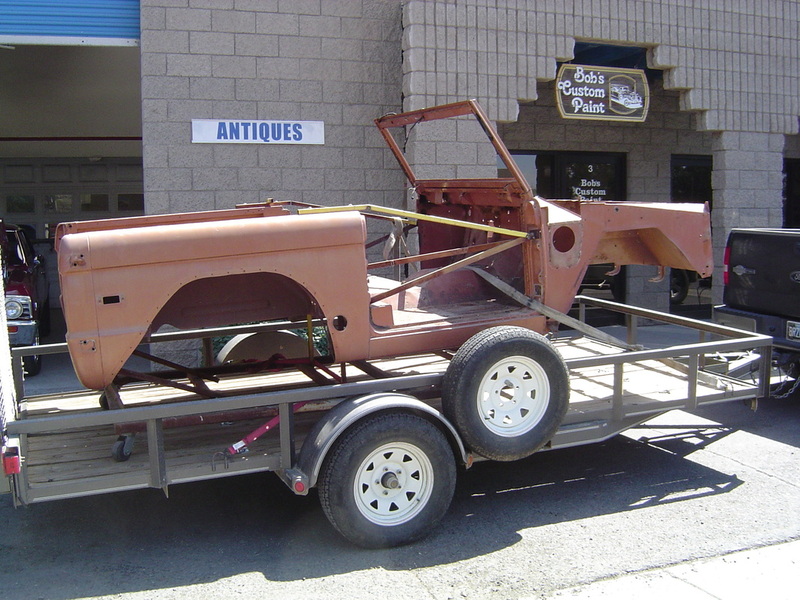 Restoring your classic car is a project that takes weeks, months, and sometimes even years. 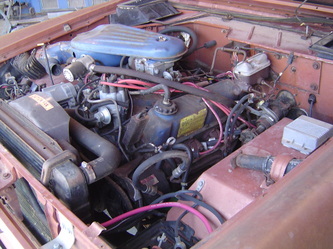 Yet, a common mistake when restoring a vehicle, is putting in a top of the line motor, with a second-rate interior. 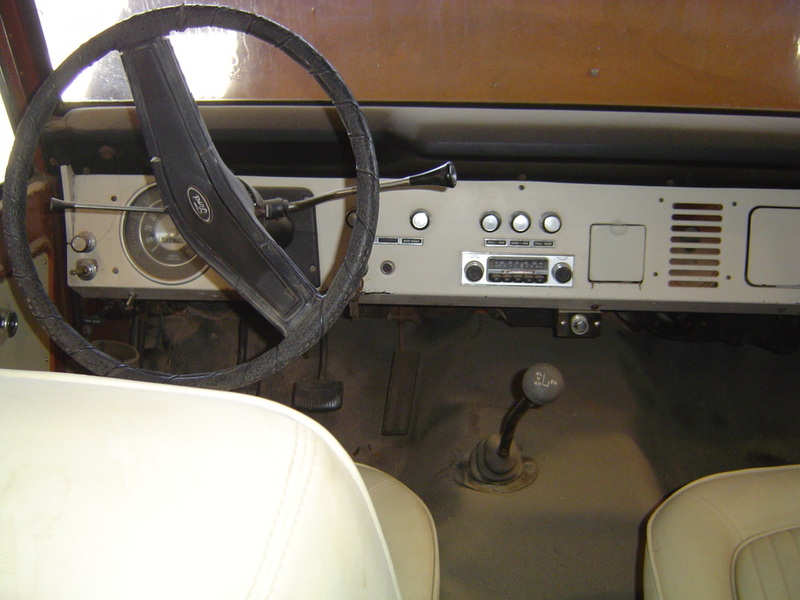 ​A completely restored vehicle is often judged on a whole, by the quality of its interior. When it comes to upholstery, you get what you pay for. You don’t want all your time and money of your restoration to reflect a second or third-rate restoration, due to the upholstery. 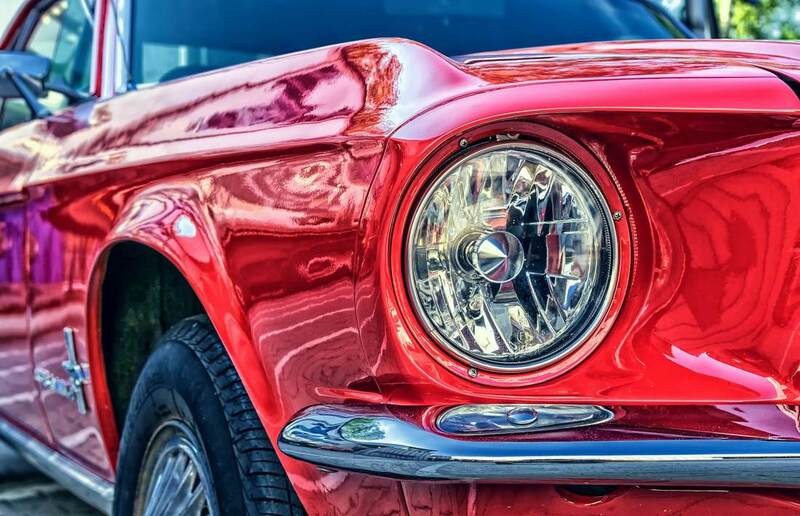 ​In order to ensure a quality restoration, it is crucial to find the perfect shop, to help realize, and attend to your classic car restoration. 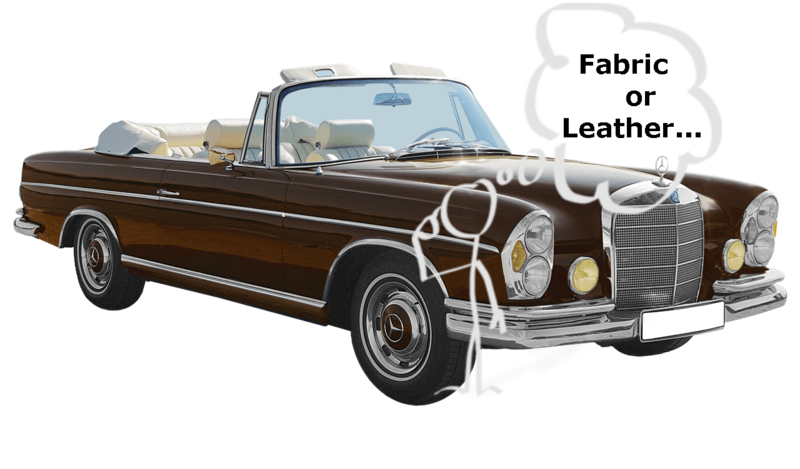 So here is a list of all aspects that you should know in order for your classic car restoration to be a huge success. ​In order to plan for success, budget early in the game. 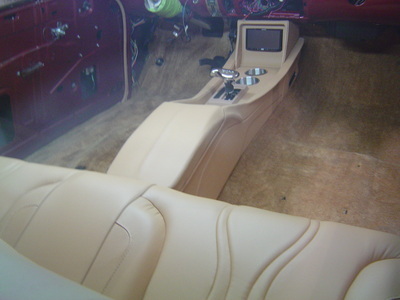 While you organize a total overhaul restoration of the body, and motor, also organize the upholstery and interior. It will give you a better idea of the total cost, as well as a steady point to steer the direction of the project. 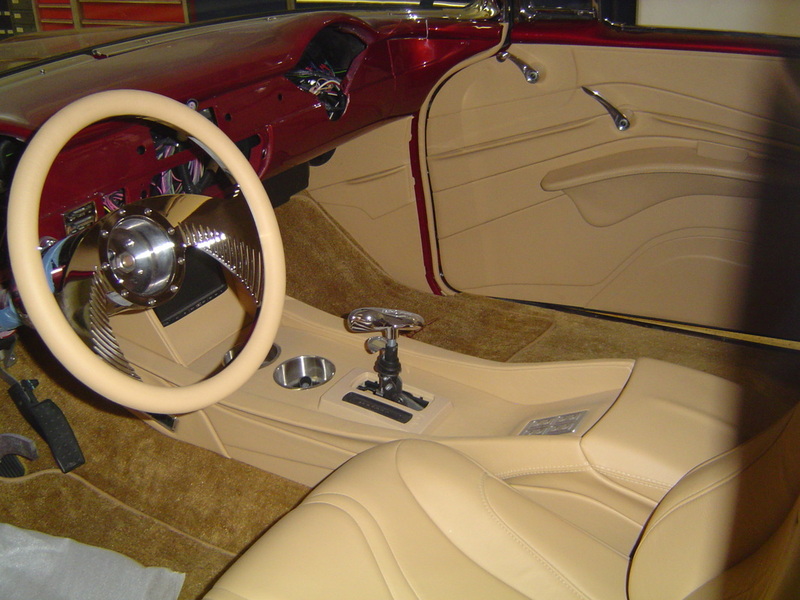 For example, an experienced interior craftsmen can provide pointer to make sure the body fabrications or paint work match with the interior. ​It is likely that if you’re doing a total restoration that you will use multiple specialist. 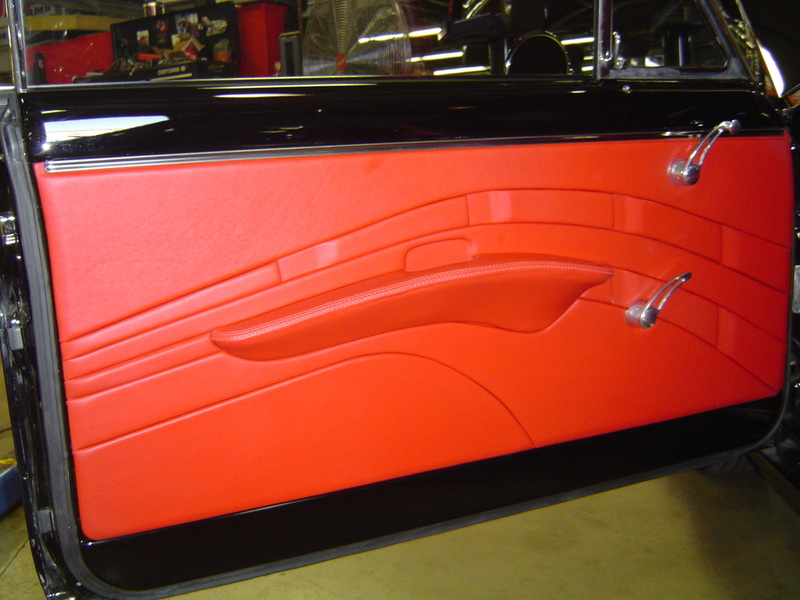 Plan ahead for specialist that do engine, paint, chrome, and upholstery. It might be cheaper to hire specialist individually, rather than having the shop subcontract other specialist. If you plan from the beginning, it will be easier to know all aspects, of what your project will need to be completed. An interior restoration or complete auto restoration project can add up quickly. It's important to obtain a total number for the entire restore project before you get started. I've seen it time and time again: the owner depletes a large percentage of his budget on one aspect of the restore process only to have their project abandon and their automobile sitting for years on end partially restored. Planning a project in phases, can give you an opportunity to budget for high-quality work. Set a budget early, and make sure the parameters of the project such as parts, materials, and price, are estimated for each phase. Remember a verbal agreement means nothing if there were to be any problem down the line. It is crucial, to make sure every aspect of your agreement, even subcontracts are in writing, before the transfer of any funds, or work begins on your restoration. 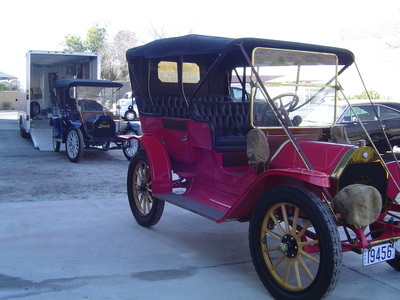 ​Unless you already have a particular professional in mind, visit and compare a few restoration shops within your area. Make sure to notice if the shops have lots of tools, or a paint room. Feel free to ask for a quote, and if the shop can accommodate your project, or will they most likely subcontract some areas? Use the information that you learn comparing the auto restoration shops to help you decided which one best fits your classic car’s needs. 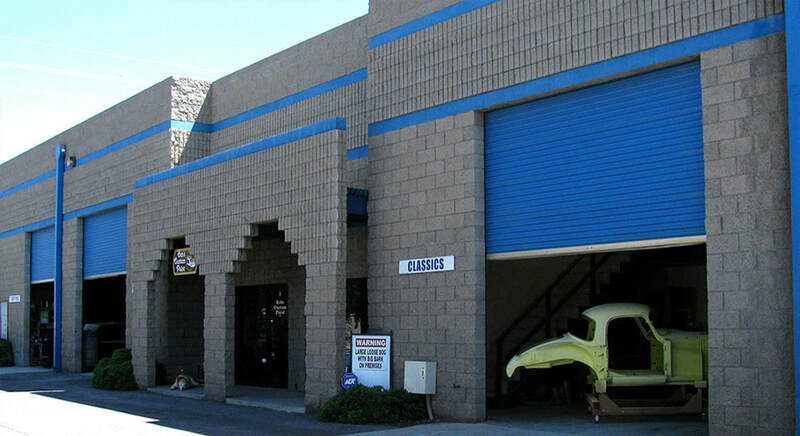 Stop by and visit our shop located in the west valley in beautiful Phoenix, Arizona! You don’t want to trust a shop that looks like they need to get their act together with your classic restoration. Cleanliness can be a quick way to indicate shop quality, and how well they will care for you vehicle. 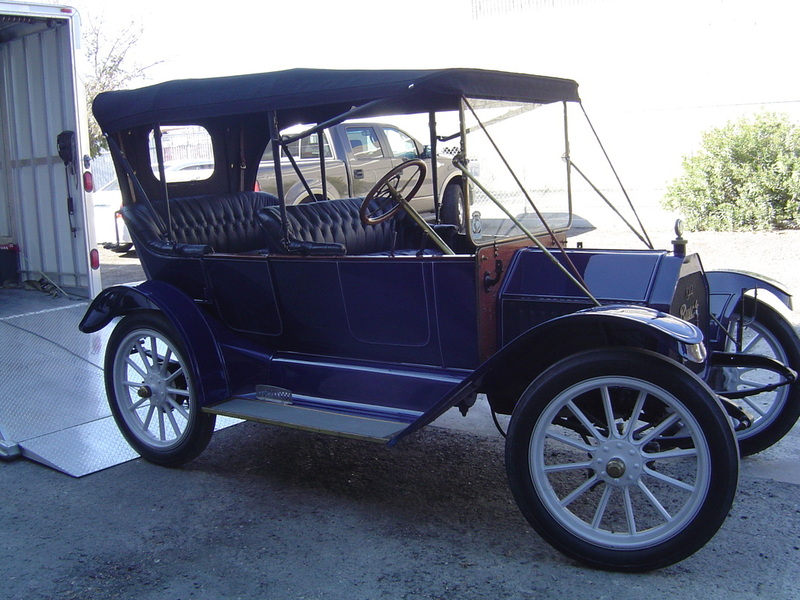 With most restoration there is little formal training, or certification for upholstery, or interior work. So, you must evaluate the quality, and extent of previous completed projects. Feel free to ask them about any show car awards the shop may have won, or photos of past work. Also make sure to clarify who will be performing the work on your vehicle, and how much experience they have. You don’t want to leave your high-end car (or soon to be high-end) in a shop for a few weeks, that doesn’t have a secure building. You also want to make sure that the shop takes protective measures to ensure nothing gets scratched or damaged while they work on different phases. Yeah, you can save money by buying your own materials. However, if they don’t hold up, you are on your own. If you use coverings that is recommended by the shop, they are more than likely tried and true quality products, which they stand behind. However, if you must buy your own, know that only automotive-grade fabrics should ever go into a vehicle, and buy top brands directly from a reputable manufacturer or brand. Want to know the best brand and materials for your project? Ask your shop’s recommendations on what you should buy. When it comes to classic cars, there are three levels of upholstery work that can be done. Street car, show car, hobby car. You should make sure to find a professional that is aware of the difference. If you are talking to one that is unaware of the difference, find someone who does. 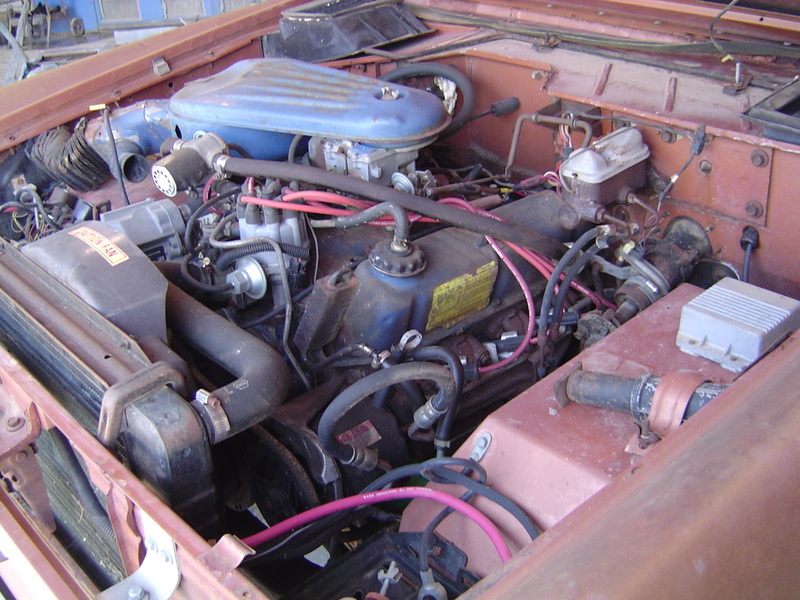 Be sure the proffessionals you're dealing with understand the difference of restoring a show car vs. hobby car. ​Any type of professional restoration shop can do a classic car, but the look you get differs with the type of shop you use. 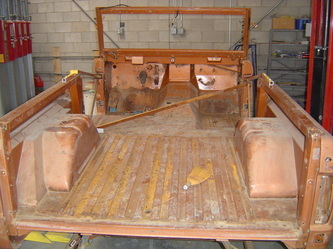 For example a restoration shop uses a professional technicians and quality materials to get excellent results. However, if you want a special design, or upholstery done is a specific way, then you may not find that particular technique in a restoration shop. 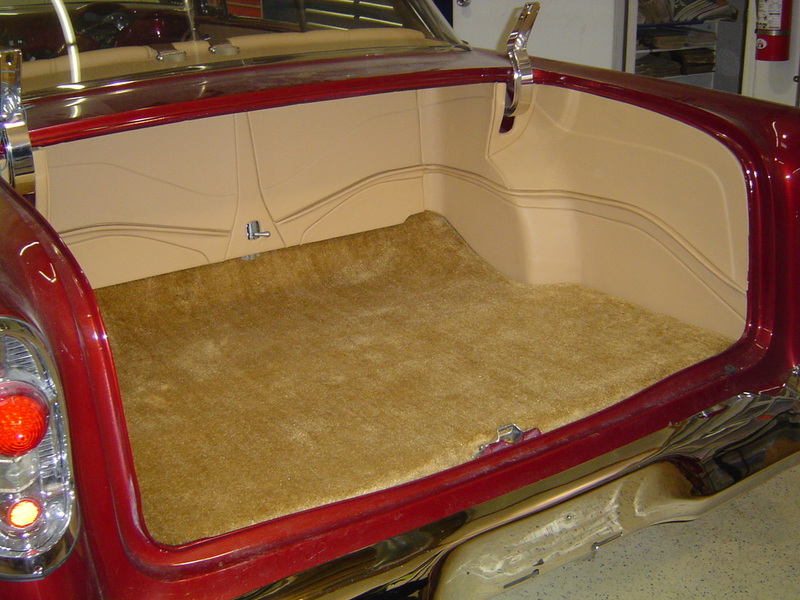 A custom shop can get you any look you want, and can add upholstery wherever you would like. You want a shop that welcomes your drop-ins, involvement and encourages you to check on your vehicle’s continual progress. 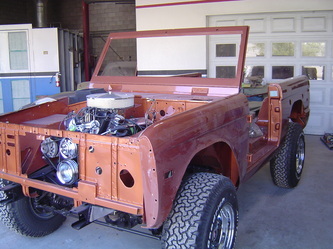 How can you be sure that the shop is maintaining your vision, or requests without being involved with the restoration process? One way to keep up regular communication, is through regular interval billing. Regular interval billing will encourage consistent communication, as well as frequent updates on the status, and the progression of your project. If you are unable to drop in personally, use this as an opportunity, for the shop to keep you informed, with emails, and photos. 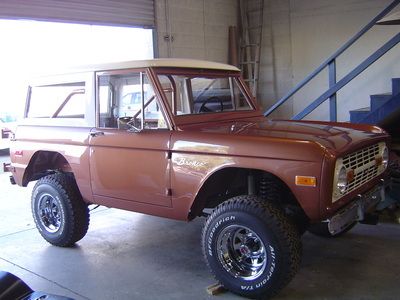 It is also nice, to ask the shop take extensive photos of anyway of each step, repair, or upgrade. ​Having step-by-step photographic evidence of your vehicle’s journey will not only be a nice memento, but may be an advantageous selling feature one day. 1965 Mustang Fastback restored from beginning to end, 26 months of work in under 5 minutes. Cheers! ​Whether your leather upholstery is a fading, creasing, cracking, or showing signs of wear, the state of your leather upholstery can change the look of the interior, even if the rest of the interior is in great condition. So before you get ugly seat covers, or book your appointment to reupholster your seats. 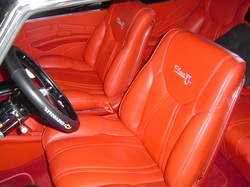 You can simply restore the leather of your interior. Leather, with good products, and proper care for will last you a lifetime. Restoring your leather seats is very expensive. However, if you are willing to use a couple hours of your time, you can restore leather yourself. What to look for in a Leather Repair kit..
Look for a leather repair kit that contains a cleaner, conditioner, and color restorer. Whichever product you decide to you, contact the distributor regarding color matching of your leather. 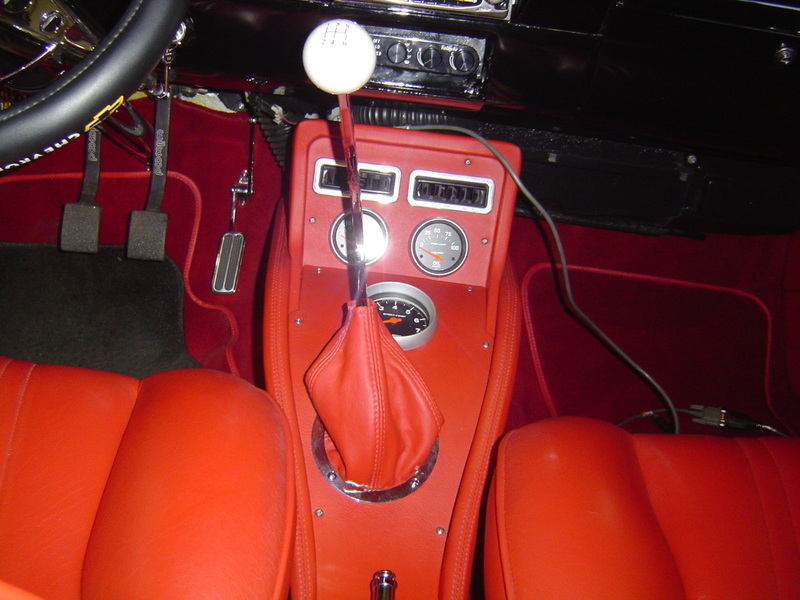 If you are restoring the original color, contact the vehicle manufacture for a color code, or send in a swatch of your leather (under the seat you will find a spare piece to sample) to the supplier of color matching solution. Also note, that there are many leather restore products on the market offer quick fixes. ​Beware of these so called quick fixes for they contain only petroleum distillates which result only in weakening the leather fibers, and stitching. For example, the silicone will harden into the leather limiting its flexibility, and the waxes will make your leather shine, only to trap dirt, and contaminate the hide. Therefore, it is crucial to understand the importance, and significance of buying quality products that actually rejuvenate your leather. Your product should contain a leather specific collagen complex, which will actually penetrate the hide, and nourish, restore, and keep the leather supple, and flexible. I’d recommend using Glipstone Liquid Scuff Master, Lexol Leather Care, and Leather World which are all highly recommended leather repair brands. Additionally, Guardsman makes a pretty good leather care product and they have a full care guide your can download here. 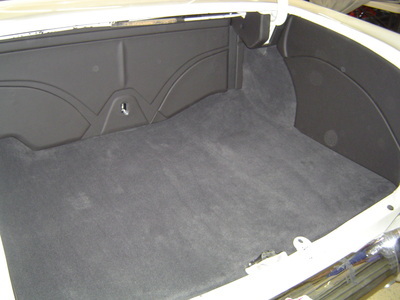 ​The first step in vehicle upholstery repair is evaluating the extent of the damage. If there are holes or tears in the upholstery, you might not be able to repair it. You can look into a leather patch repair kit, but if you want a flawless repair, see a professional. Also, if the leather damage extends to the seat belt, or other safety equipment, you will want to seek a professional to tackle the repairs. Do not try to tackle any repairs that involve the safety equipment of the vehicle. The best way to deep clean your interior of your vehicle is to remove everything from the vehicle, including the seats, if accessible. You will want to thoroughly clean every nook and cranky of the interior. 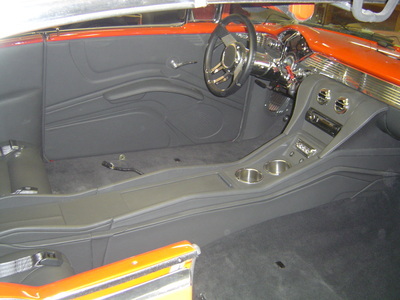 That includes thoroughly vacuuming the seats, and floorboards, and examining the surfaces for stains or blemishes. Use a leather cleaner product, and a damp cloth or sponge and rub in circular motion to remove initial dirt. For the grimy spots, use the leather cleaner and the soft-bristle brush. Once satisfied, remove the any cleaner residue and gently wipe the area with a mild solvent like isopropyl alcohol. Once the leather is again completely dry, examine the surfaces for worn or faded spots. ​Make sure the leather has been cleaned, like the above instructions. When the leather is dry, gently sand the cracked areas with a 600 grit sandpaper, until smooth. Careful not to remove too much old leather with the sandpaper, that you create a suede. Next open a leather repair kit, one that has a leather sealant product, or leather crack filler. Use the product to smooth out the cracks according the packaging. Once the leather is dry, you can continue on to sand, or layer if necessary. Once you have maintained a flawless finish, move on to the next step. 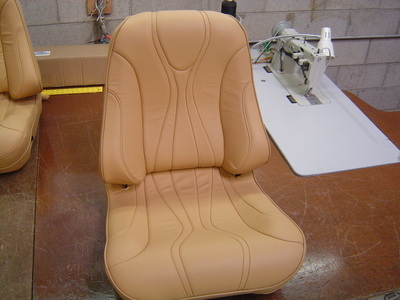 If your leather seats are faded, you can also restore or change the color. Before you begin, test a small spot to make sure your color matches your swatch, and are happy with the color.Keep in mind, it is normal for the color to be slightly more vibrant until it dries. When you are ready to begin, consult your packaging instructions, and start with the seams, pipping, and edges, and allow them to dry. Then proceed to the broader areas. Apply several thin coats, making sure to brush in all directions. Careful, not to stop in the center or middle of a panel. In order to get a professional looking job, work slow, and consistently. Allow each piece to dry thoroughly before you continue to apply another coat. If you are changing the color, expect to have to do additional coats. Depending on the instruction of the product that you used, 24- 48 hours later when the leather is dry completely, use a leather conditioner to bring a rich shine to the leather. 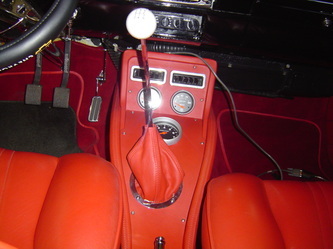 ​If you also want to dye or restore the leather of your steering wheel, the steps will be the same. 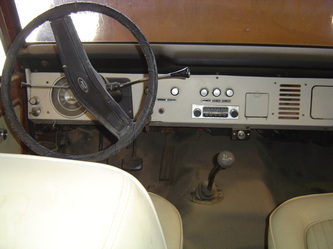 However, usually steering wheels have a protective clear coat protection on them. It is important to replace this finish after, with an application of leather clear coat. ​Once you are satisfied with your leather, and it is fully dry, your leather ready to be conditioned. Most leather-care products come with a toner to alter the color, so test a small area for a color match, and alter the solution as needed. Apply to product per the manufacturer’s instructions, usually with a soft-bristle brush or sponge. If your leather has creases or cracks, dilute the product by 30% with water, and rub it into leather. Letting it dry for a minute or so, and rubbing the solution off with a damp cloth. The product will come off the leather but should remain in the creases, and cracks. Now that your leather upholstery is in great condition again, how do you keep it that way? ​Maintain a clean vehicle interior, by vacuuming debris regularly, cleaning all upholstery with gentle cleaner. Be sure to use the right products, for the right upholstery. 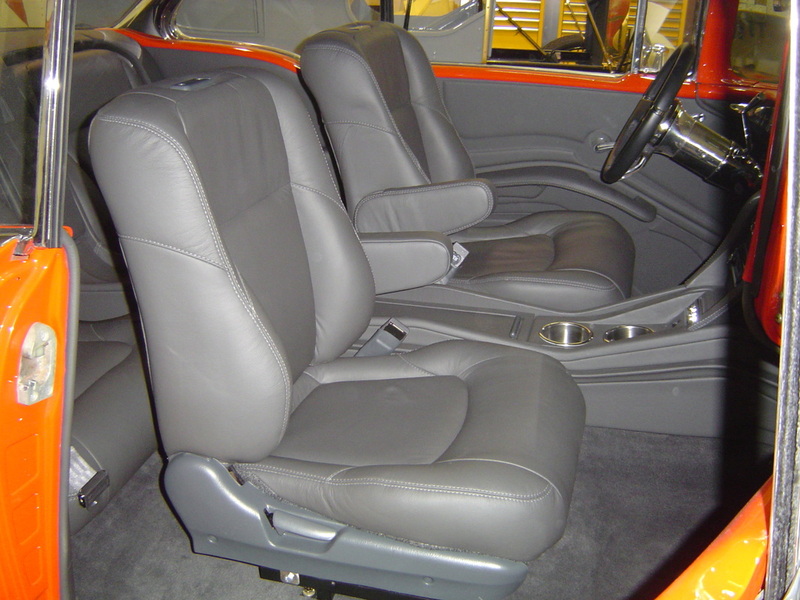 After cleaning, finish the job by applying a leather conditioner to your leather upholstery. The conditioner will help the leather upholstery with their pliability, and will prevent cracks, and signs of wear. 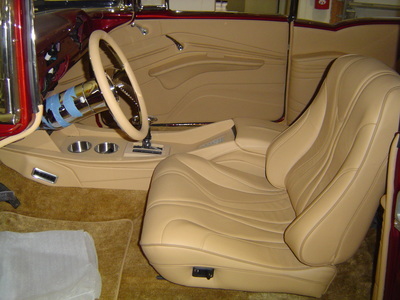 ​Leather upholstery will fade, or crack with continuous extended periods of direct sunlight. Use a sunshield in the windshield if you have to. If your side windows aren’t tinted, you can use window panels to minimize the sun’s intensity, and to shield potential damage. ​Always put bulky objects in your trunk if possible. 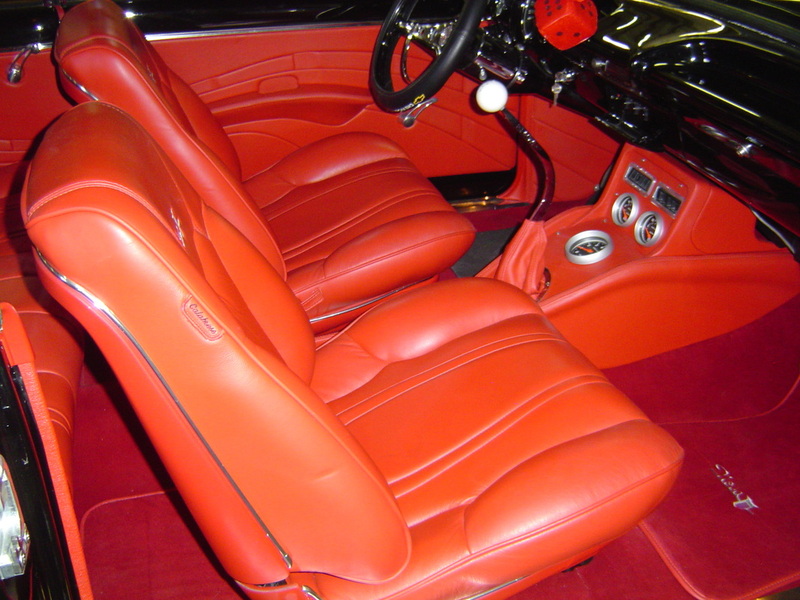 When putting objects on the seat, make sure to lay down something over the leather for protection, like a blanket or pad. Sharp or bulky objects is the easiest way to rip or tear your upholstery. So don’t keep tools, pet carries, or sharp objects directly on the seat. This customer owned this truck since it was new. They raised their kids in it and was the wife's grocery get er for many years. 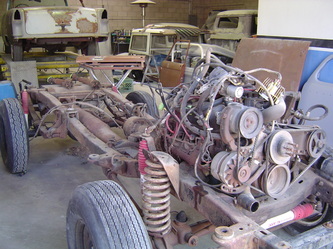 We are pulling it all apart, rebuilding the motor and all suspension, brakes, steering, and body. 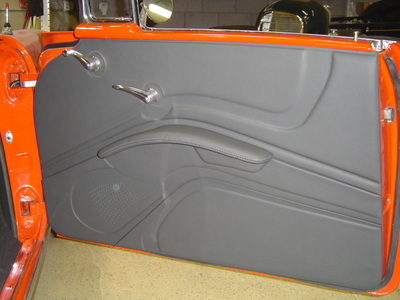 The body was sent off to get blasted and floor panels ordered. 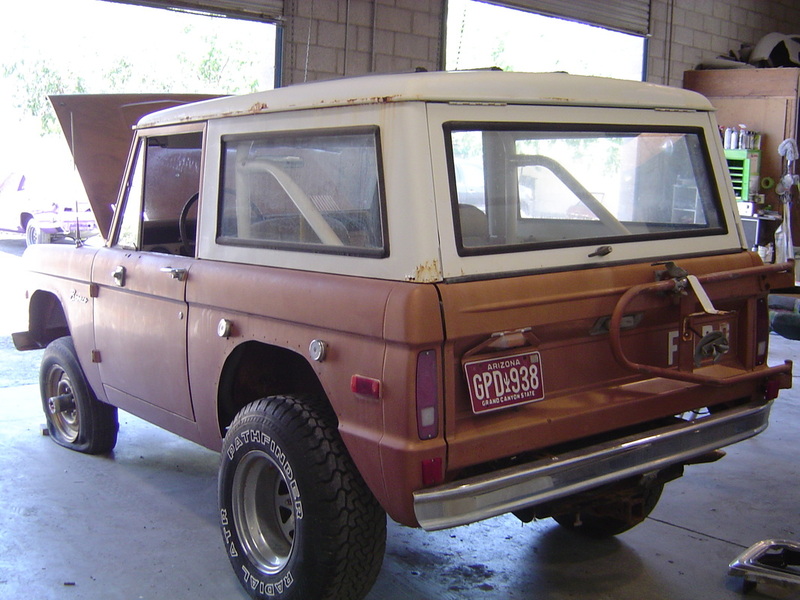 However for a Bronco the body was intact and the body was solid due to being an Arizona car. 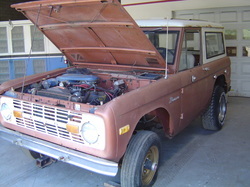 Dad wanted to scrap it, but Mom wasn't done driving it ,so Dad is fixing it back to new for Mom. Don't tell me wife's don't have a say on how men spend their money. Early iron and upholstery is no problem. Sams father taught him right and also how to things right. There is no substitute for experience and we have that. Young guys have no clue to how the early tops and seats were done. 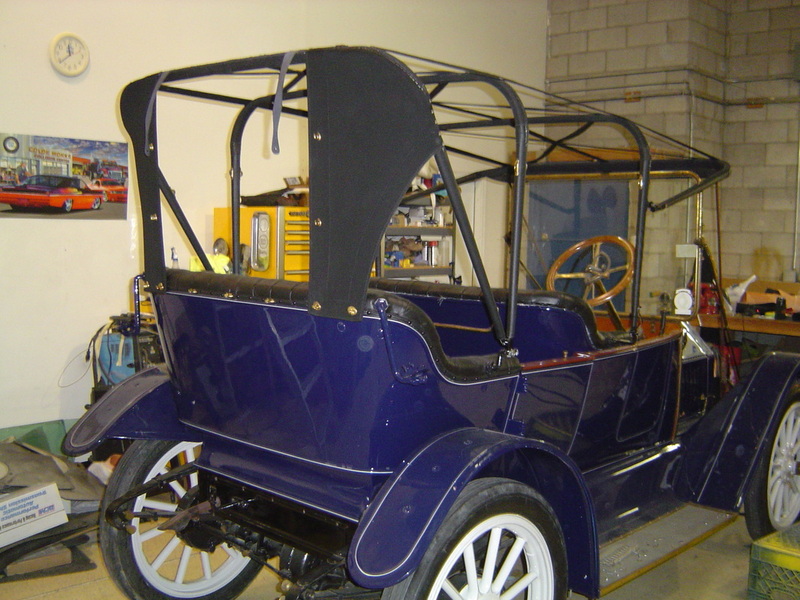 Along with these two cars we are also building a complete interior and top for a 1910 Model T. We are not afraid to tackle any job and will make it right. Sam out did him self this time. A complete hand built one of a kind console running all the way back and up over the rear seats. 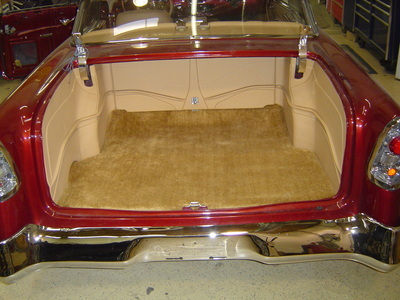 He hand made the rear seats and wrapped it all in leather. 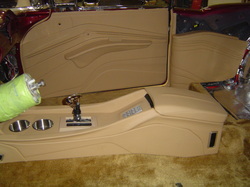 Sam custom fit the customer to the front seats for added comfort on the long road trips. He added seat warmers. 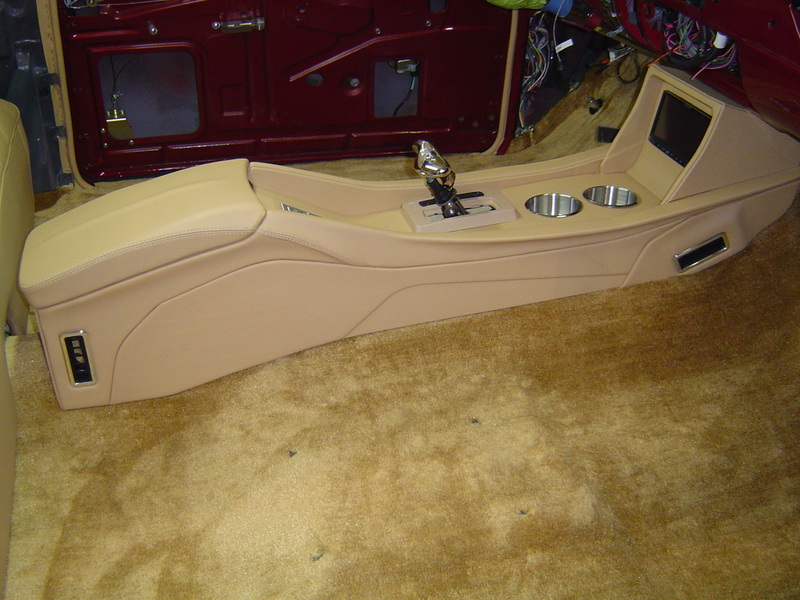 lumbar support and a hand built arm rest and finished it all in leather.The trunk had to be of the same quality as the interior. 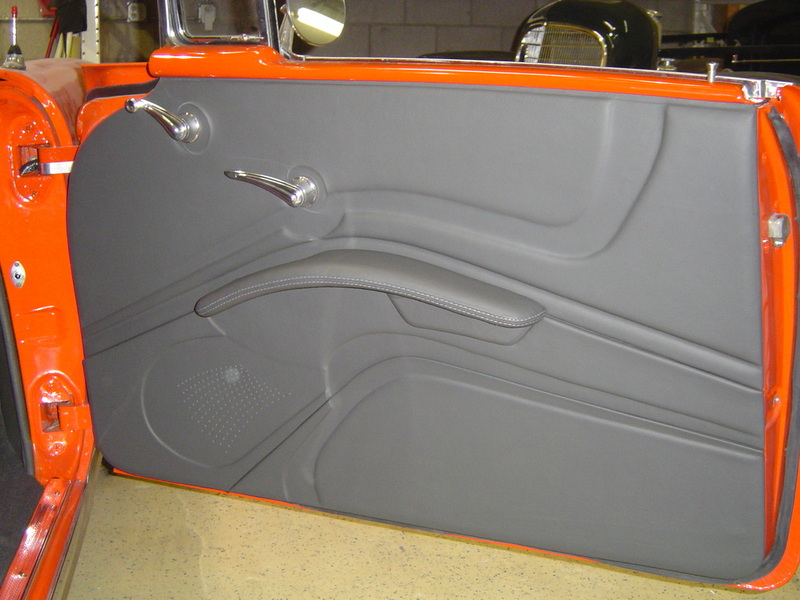 Sam pays great attention to detail, as can be seen in the door panels. 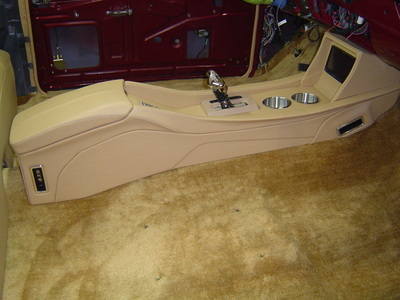 He hand made the arm rest and sculptured the door to fit with the console design. This job was tag teamed with Chucks Speed Shop to insure a quality job both under the sheet metal and the comfort of the interior. We look forward to the doing more high quality workmanship with our friends at Chucks.